Orchids make beautiful gifts (that keep on giving!) for occasions like Mother’s Day. But how can you make it a truly unique and special gift that goes beyond just the plant itself? Well, we’ve got you covered. Here are some fun and different ways to gift an orchid plant this Mother’s Day. 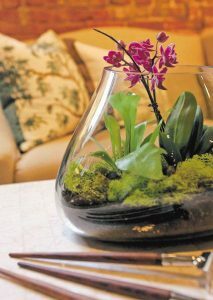 With the popularity of mini orchids these days, creating a small terrarium with your orchid is easy and attractive. It also shows the effort and care you put into creating a unique plant habitat for your mother. A simple yet unique way to gift an orchid is wrapping it up. Do you have artwork? Use it to wrap around the pot. You can write a message on the inside that your mom can read after unwrapping the orchid. Have a colorful sock but can’t find it’s mate? (Who doesn’t have a lone sock, right?). Slip it over the pot and cut off any extra. The elasticity will hug the container and you won’t even need tape or glue. 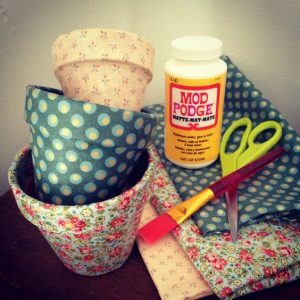 Have some fun fabric? Cut it to fit around the pot and then use some glue to seal it on. Have an ugly clay pot? Grab some paint and paint a Mother’s Day message or design. 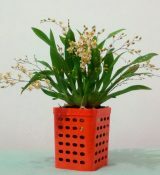 The possibilities are endless and you can decorate the orchid pot in a way your mother will love! So your mother doesn’t have a green thumb? That’s ok! She can still appreciate the beauty of an orchid as art on her wall. If you don’t have a photograph of an orchid, visit your local botanic garden and snap a quick photo. Even your local grocery store will most likely have orchids for sale that you could take a photo of. Then get a framed print or canvas from somewhere like mpix.com or a local print shop. 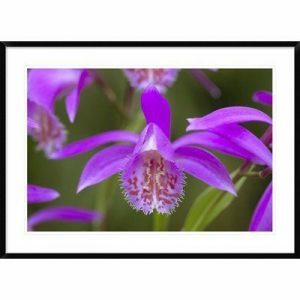 Wrap it up and presto, you’ve given your mother the gift of both an orchid and gorgeous new wall art!